Top Online Casinos 2009 - GOM Players' Awards. Top Online Casinos, Poker, Bingo & Sportsbook Sites - Gambling Online Magazine Readers' Poll Results 2009. 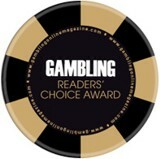 Gambling Online Magazine (GOM) 2009 readers' choice awards include 20 different categories where the readers choose top 2 websites. The Gambling Online Magazine Annual Readers' Polls are the only awards in the Internet gaming industry that are voted by the public themselves. The most coveted awards has entered its 8th year of providing the peoples voice on the best of the best. Ranging from Top Poker site to Top Skill Games that Gambling Online Magazine Readers' Poll Awards covers everything in online gambling. See the most trusted online gambling destinations of 2009 GOM readers: online casinos, poker rooms, bingo, mobile gaming sites, sportsbooks and more. This year we added Gambling Online Magazine's top picks for online bingo and sportsbook sites. Blackjack category disappeared. We also see big moves in the mobile gaming awards. Poker grows in popularity, so more poker categories were added to the readers' polls. 888.com/Casino-on-Net occupies the top spot of the 2009 GOM "Best Casino" awards. Voted #1 in the most prestigious category last year, the casino outperformed long-time leader - InterCasino - for the second time in this year's poll results. Gibraltar-based 888 is the established leader in the global online gaming market. "At 888, we're all about customer service and satisfaction," says John Anderson, 888 Holdings PLC CEO. "We believe that people respond positively when treated fairly and respectfully; especially when you offer them the very finest and most entertaining gaming products available online." Far from being shackled by the economic downturn, 888 has dealt with the various challenges of the past 12 months with consummate ease and professionalism, not only surviving, but thriving in an incredibly competitive market. In doing so, the site has further enhanced its reputation as one of the world's most popular and recognisable gaming entertainment brands anywhere on the web. Online Casinos, Poker Rooms And Gambling Sites By CASINOMEISTER 2009. CasinoMeister, known casino watchdog and players advocate since 1998, announced its 2009 best and worst online gambling sites' awards. This popular portal names one site for each of the several online gaming categories. Below are the most trusted online gambling sites from the Meister. Casinos listed below give credence to the online gaming industry. Club USA - US players still have reputable casinos to choose from. 2008 Awards Winner - 32Red Casino. From their launch in August 2002 up until now, they have never wavered from the path of excellence. 32Red is owned by the British group "Trafalgar Betting and Gaming" and hold a Gibraltar licence and IGC membership. The professionally presented and colourful site carries a big Microgaming suite of over 300 download and Flash games of above average quality and play and the whole thing is backed by 24 hour and fully contactable Support and a range of financial options through Proc Cyber Services. One of the several things that impressed us about the site was the experience of the directors and managers. The CEO is ex-Ladbrokes veteran Ed Ware, the finance boss is Paul Webb who was at Victor Chandlers and another Ladbrokes man, Graham Campbell heads Operations. "They have maintained their focus since their launch: personable customer service, responsive and effective management, professional solid operations. Publicly traded, fully transparent, and they are bound by an ideology that is based on player satisfaction. These guys have a lot to be proud of...again," added Bryan Bailey from Casinomeister.